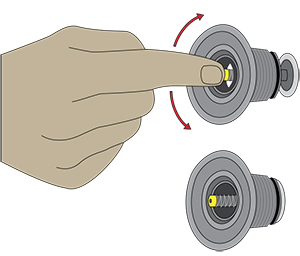 Push in and twist with your finger to make spring-loaded valve stem pop from the open position (top) to the closed position (bottom) and then you can add air. To deflate, just push in and twist until the valve locks in the open position. 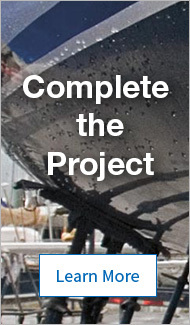 West Marine’s inflatable boats include top-quality, US made Halkey Roberts air valves. These are great valves, and are simple to operate. However, some of our customers and associates, including me, have experienced frustration in figuring out how they work. They report that air starts escaping from the valve immediately after they remove the air pump, and have trouble fully inflating the boat. They try, without success, to quickly put the cap on, while air rushes out. Later, the boat starts losing air after only a few hours. What is wrong? Here’s the solution to this frustrating problem. The Halkey Roberts valve has a special pushpin inside. This pushpin has two positions, both up and down. When it is pressed in the down position, air will escape. If you turn the pushpin in any direction it will pop up. This will lock air inside and prevent it from escaping through the valve. Before inserting the air pump tube into the valve, please make sure that the pushpin is in the upper, popped up position. Once the pin is in the “popped up” position, insert the air pump tube into the valve and inflate the boat until it becomes hard. Once you remove the air pump, air will seal the valve and will no longer escape. When you want to deflate the boat, press down on the pushpin and turn it in any direction until it stays in the pressed down position. Air will immediately escape from the tubes thru the valve.